Irresistible cheese bread, heated right on the barbecue. Preheat barbecue to medium heat. 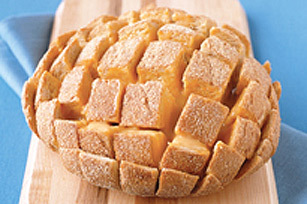 Cut loaf into 1-inch slices, being careful to not cut through to bottom of loaf. Turn loaf one half turn. Repeat cuts to resemble fingers. Spread Cheez Whiz between bread pieces. Wrap loaf in heavy-duty foil; place on upper rack of barbecue. Close lid. Grill 15 min. Unwrap bread. Serve whole and let everyone serve themselves by pulling off their own bread pieces. Before wrapping with foil, brush with 3 Tbsp. Kraft Sun-Dried Tomato & Oregano Dressing and sprinkle with chopped fresh herbs. If a barbecue is not available, preheat oven to 400ºF. Assemble and wrap bread as directed. Bake 15 min. or until heated through. Serve as directed.